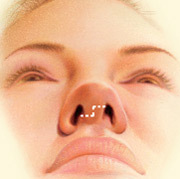 Secondary rhinoplasty, or revision nose surgery, is a “second” rhinoplasty to improve upon or correct a previous nose surgery. Why do people choose secondary rhinoplasty? A rhinoplasty is intended to better proportion the size or shape of the nose for overall harmony of the face. Unfortunately, some rhinoplasty surgeries result in either an over correction or under correction to the size or shape of the nose. Additionally, some rhinoplasty procedures result in either poor cosmetic appearances, or leave patients with continued breathing or structural problems. In these situations, patients remain unhappy with the results of their first surgery and still desires a well-proportioned corrected nose. A secondary rhinoplasty can help to correct both the appearance and structure of the nose. Such complex revision procedures require a skilled, well trained, and experienced plastic surgeon like Dr. Armenta. A secondary rhinoplasty is similar to a rhinoplasty, however it is much more complex and more involved to make minute corrections and properly handle the scar tissue from the previous surgery. If the available cartilage from the nose was used in the first surgery, it may be necessary to use cartilage from the ear or ribs for a secondary rhinoplasty. Most often secondary rhinoplasty is an outpatient surgery but if the corrections are more extensive, it may require an inpatient stay for comfortable monitoring. What can I expect from a secondary rhinoplasty? The results of a secondary rhinoplasty are permanent and most noticeable once the swelling to the nose and face has resolved in two to three weeks. Over the next six months, the swelling and scar tissue should resolve and soften. Patients will then find themselves elated to finally enjoy an improved self-image along with a more balanced facial appearance. How can I learn if a secondary rhinoplasty is right for me? If you’d like to make an appointment for a consultation to learn whether a secondary rhinoplasty is right for you; contact Dr. Art Armenta’s office. Dr. Art Armenta is certified by the American Board of Plastic Surgery and a member of the American Society of Plastic Surgeons.